Ellie and Jack attend middle school, and they are both dealing with pressure. 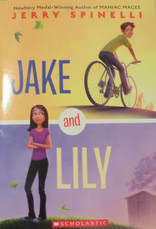 Ellie's trying to navigate her social world after "breaking up" with a long time friend, and Jack is socially popular, but deals with constant pressure from his father and brothers to train and be the best athlete possible. Be careful what you wish for, because just when they wish they could take a break from their lives - they swap places for a weekend. This is a really cute story and the details are handled well - because we get to know Jack and Ellie before the switch, we also get to see the way their perspectives change. Ellie is quite insecure, and then she's dropped into a family that expects her to run around a mountain at O'Early Thirty. Jack is the object of several crushes, but as Ellie, he attends a slumber party where he's slighted by a girl who supposedly adores him. Family relationships are explored with thought as well as school relationships - good treatment of the Freaky Friday sort of story.